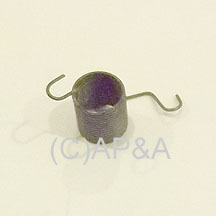 Torsion spring for right flipper on vintage Gottlieb electro-mechanical (EM) games. Mounts over flipper bushing and connects to flipper crank. Returns flipper to 'rest' position. Measures approx. 5/8-inch long, 9/16-inch diameter. Commonly broken on many older games. Used on most Gottlieb games from approx. 1955-1977. May also replace older Williams # 03-0287.